You may try to use Vlearn for free until August 17, 2014. Just follow the instructions stated above. VLearn contains supplementary study resources like educational videos. Although many were skeptical of the green chemistry movement at first, it has become a multimillion-dollar business. In preventing the creation of hazardous wastes, laboratories and corporations can save millions in clean up efforts and related health costs. 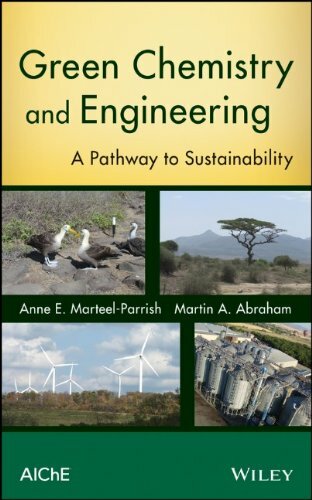 This book supplies students with concepts commonly taught in undergraduate general chemistry and general engineering courses, but with a green perspective. It is unique in presenting an integrated discussion of green chemistry and engineering from first principles – not as an afterthought. Real-world examples show creative problem solving based on the latest issues. Throughout the book, the author sets forth examples that refer to a detailed simulation of a process for the manufacture of acrylic acid that provides a unifying thread for equipment sizing in context. The manufacture of hexyl glucoside provides a thread for process design and synthesis. 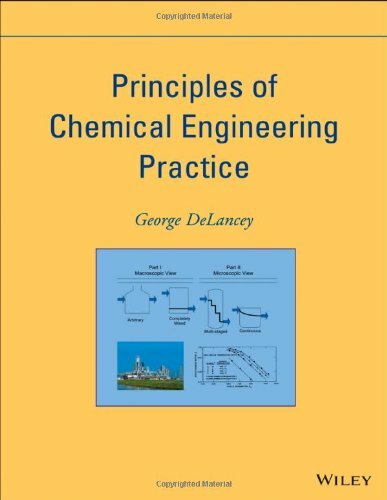 Presenting basic thermodynamics, Principles of Chemical Engineering Practice enables students in chemical engineering and related disciplines to master and apply the fundamentals and to proceed to more advanced studies in chemical engineering. Covering the whole value chain – from product requirements and properties via process technologies and equipment to real-world applications – this reference represents a comprehensive overview of the topic. The editors and majority of the authors are members of the European Federation of Chemical Engineering, with backgrounds from academia as well as industry. Therefore, this multifaceted area is highlighted from different angles: essential physico-chemical background, latest measurement and prediction techniques, and numerous applications from cosmetic up to food industry. Recommended reading for process, pharma and chemical engineers, chemists in industry, and those working in the pharmaceutical, food, cosmetics, dyes and pigments industries. Separation and purification processes play a critical role in biorefineries and their optimal selection, design and operation to maximise product yields and improve overall process efficiency. Separations and purifications are necessary for upstream processes as well as in maximising and improving product recovery in downstream processes. These processes account for a significant fraction of the total capital and operating costs and also are highly energy intensive. 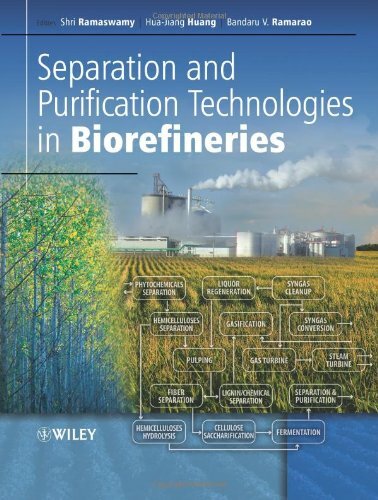 Consequently, a better understanding of separation and purification processes, current and possible alternative and novel advanced methods is essential for achieving the overall techno-economic feasibility and commercial success of sustainable biorefineries.This book presents a comprehensive overview focused specifically on the present state, future challenges and opportunities for separation and purification methods and technologies in biorefineries. Equilibrium Separations: Distillation, liquid-liquid extraction and supercritical fluid extraction. Affinity-Based Separations: Adsorption, ion exchange, and simulated moving bed technologies. Membrane Based Separations: Microfiltration, ultrafiltration and diafiltration, nanofiltration, membrane pervaporation, and membrane distillation. Solid-liquid Separations: Conventional filtration and solid-liquid extraction. Hybrid/Integrated Reaction-Separation Systems: Membrane bioreactors, extractive fermentation, reactive distillation and reactive absorption. The book presents modern and efficient methods for solving Geodetic and Geoinformatics algebraic problems illustrated with Mathematica using computer algebra techniques of Ring, Polynomials, Groebner basis, Resultants including Dixon resultant, Gauss-Jacobi combinatorial and Procrustes algorithms as well as homotopy methods. These problems are traditionally solved by approximate methods. This book presents alternative algebraic techniques based on computer algebra tools. This new approach meets such modern challenges as resection by laser techniques, solution of orientation in Robotics, transformation and bundle block adjustment in Geoinformatics, densification of Engineering networks, analytical solution for GPS-meteorology and many other problems. For Mathematicians, the book provides some practical examples of application of abstract algebra and multidimensional scaling. The book contains papers that focus explicitly on the last achievements (methods, algorithms, models, systems) with respect to the Third Dimension. Motivated by the rapid developments in 3D, the organised workshop aims at attracting the best world-wide research in the following areas: 3D geo information requirements (based on analysis of applications), 3D data acquisition and processing (LiDAR, Photogrammetry), 3D object reconstruction, 3D spatial data models (vector, voxel, CSG, tetrahedrons, curved surfaces, etc. ), 3D GIS and time, 3D in spatial databases, 3D topology and network, 3D visualization, Augmented and Virtual Reality, 3D spatial analysis and simulation, 3D Indoor/Outdoor Navigation, 3D and levels of detail (scale/resolution), 3D City Model and Building Model (outdoor and indoor integration), 3D applications (3D cadastre, 3D utilities, 3D city and urban planning modeling, etc. ), 3D standards. The papers are organized in three parts as follows: Data acquisition and processing: advanced approaches for 3D data collection, processing and methods for real-time data acquisition – Data modelling and management: topological, geometrical and network models for representation and maintenance of 3D geo-information in geographical multi-scales – Data analysis and visualization: frameworks for representing 3D spatial relationships, 3D spatial analysis and algorithms for indoor/outdoor navigation, interpolation, etc. Advanced Virtual Reality and Augmented Reality visualization. Metadata research has emerged as a discipline cross-cutting many domains, focused on the provision of distributed descriptions (often called annotations) to Web resources or applications. Such associated descriptions are supposed to serve as a foundation for advanced services in many application areas, including search and location, personalization, federation of repositories and automated delivery of information. Indeed, the Semantic Web is in itself a concrete technological framework for ontology-based metadata. For example, Web-based social networking requires metadata describing people and their interrelations, and large databases with biological information use complex and detailed metadata schemas for more precise and informed search strategies.There is a wide diversity in the languages and idioms used for providing meta-descriptions, from simple structured text in metadata schemas to formal annotations using ontologies, and the technologies for storing, sharing and exploiting meta-descriptions are also diverse and evolve rapidly. 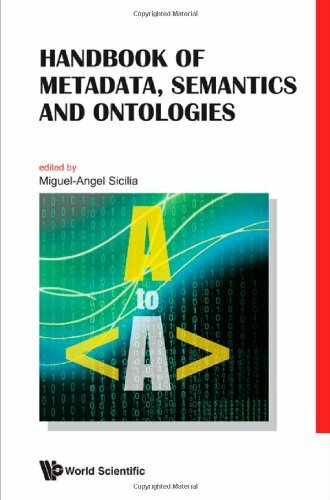 In addition, there is a proliferation of schemas and standards related to metadata, resulting in a complex and moving technological landscape — hence, the need for specialized knowledge and skills in this area.TheHandbook of Metadata, Semantics and Ontologiesis intended as an authoritative reference for students, practitioners and researchers, serving as a roadmap for the variety of metadata schemas and ontologies available in a number of key domain areas, including culture, biology, education, healthcare, engineering and library science.Readership: Graduates and senior undergraduates in computing or information science; researchers in metadata, semantics and ontologies; practitioners in planning or managing information systems.